Sign up for a free membership in the JGS Book Club. You will receive a free personal and professional development newsletter. Also you will be notified of free webinars based on Donna's three books: Just Get Serious About Success; Know Yourself & Believe In Yourself; and Discover & Pursue Your PASSION! 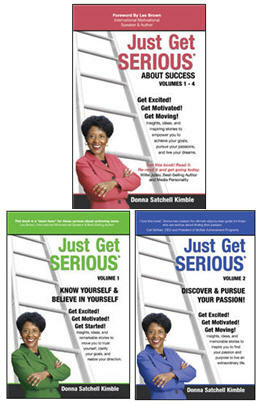 Just Get Serious About Success Volumes 1 - 4 Know Yourself & Believe in Yourself - JGS Volume #1 Discover & Pursue Your PASSION! - JGS volume #2 Have not read any of the JGS books.